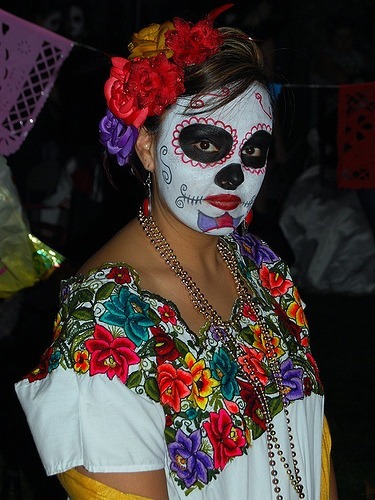 First is the annual “Día de los Muertos” Festival located at Desert Memorial Park, corner of Da Vall Drive & Ramon Road, on Saturday, October 28th from 11 am to 3 pm. Attendees will enjoy mariachi bands, folkloric dancers, an art contest for students, a children’s craft area supervised by S.C.R.A.P. Gallery, community resource tables and delicious food. 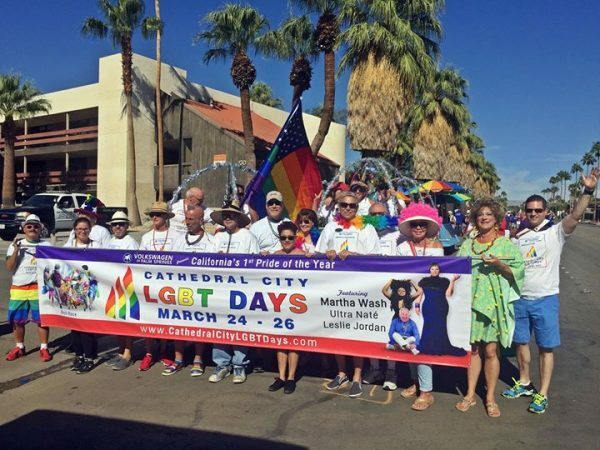 The festival, sponsored by the City of Cathedral City as the Title Sponsor, celebrates the lives of those who have passed. Attendance and parking are free. On Sunday, October 29th from 1:00 pm to 3:00 pm in front of City Hall, we celebrate the 3rd Annual Halloween Spooktacular, presented by Volkswagen of Palm Springs. Halloween Spooktacular is a safe communities, Halloween event for the entire family featuring trick or treating for kids with more than 20,000 pieces of candy being given away thanks to the City’s partnership with La Michoacana Dulceria/Candy Store. The event also includes DJ music, public safety exhibits from the Cathedral City Police and Fire Departments, a ballet folklorico dance troupe, Kids Art Party by S.C.R.A.P. Gallery, Party Life Photo Booth, and the “Bus of Horrors” by Sunline Transit Agency and the Cathedral City High School Theater Department. Halloween Spooktacular is a great opportunity for families to interact with public safety personnel and get up close to fire trucks, police vehicles, and police motorcycle patrols. This creates an opportunity for residents to connect with public safety officials to build safe communities in Cathedral City. Halloween Spooktacular also features hourly costume contest where children can win a bike and bike gear. Children will also receive a limited number of free trick or treat bags so that they can go home and celebrate with their family in their own neighborhoods on Tuesday evening. 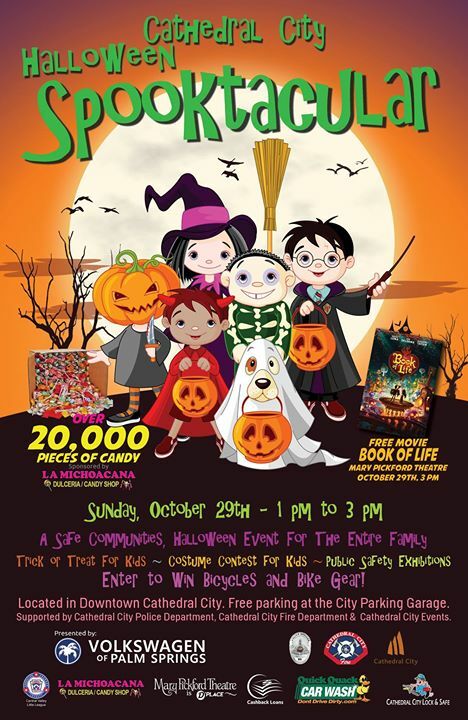 Following Halloween Spooktacular, the Desert Cinemas located steps away is offering a free screening of “The Book of Life”movie on a first-come, first-serve basis beginning at 3:00 p.m. Line passes for the free screening are available at the Mary Pickford Theatre’s Box Office beginning at 10:00 a.m. on Sunday, October 29, 2017. It will be a Spooktacular time! On Sunday, November 5th starting at 9:00 am and running through Sunday, November 12th until noon is the annual Healing Field event. This static display of flags is a tribute to the men and women of uniform who gave the ultimate sacrifice to our country since September 2001. The event is organized by the Cathedral City Rotary and sponsored by the City of Cathedral City. 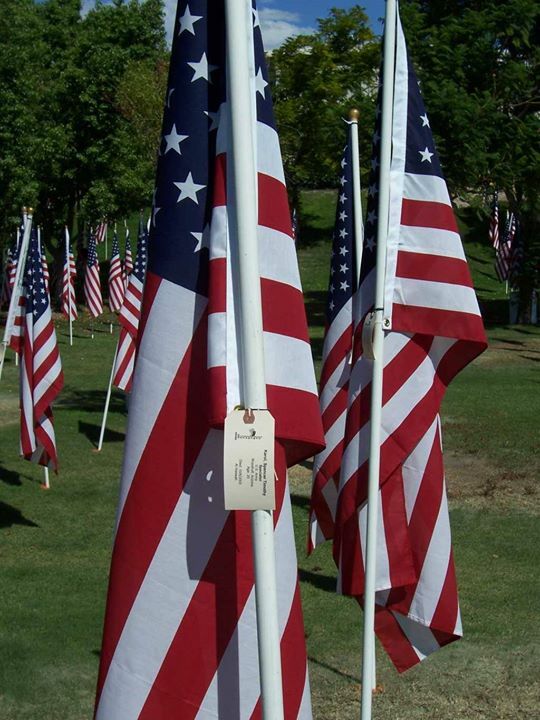 Located in Patriot Park next to Big League Dreams Sports Park at the corner of Date Palm Drive and Dinah Shore Drive, Healing Field begins with Opening Ceremonies on Saturday, November 5th at 9:00 am, followed by the reading of names and a static display of more than 6,000 American flags representing the fallen heroes. 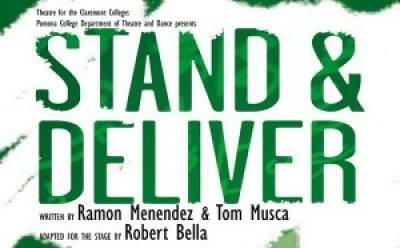 Closing Ceremonies occur on Saturday, November 12th at noon. 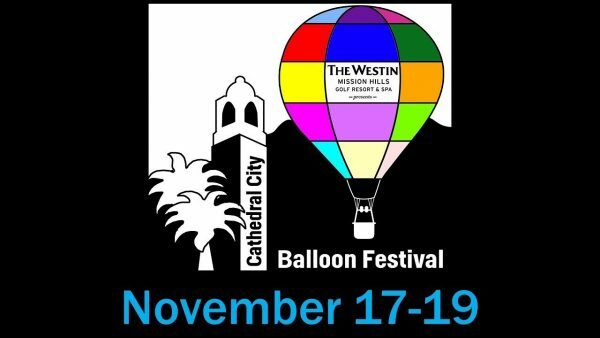 On Friday, November 17th through Sunday, November 19th, the City of Cathedral City celebrates the 4th Annual Cathedral City Hot Air Balloon Festival, presented by Westin Mission Hills Golf Resort & Spa. The festival will bring more than 35 hot air balloons from across the United States and Canada to the Coachella Valley for a kaleidoscope of color, art, sound and enjoyment. The number of new activities continues to expand each year with balloon rides across the Coachella Valley, balloon glows on Friday and Saturday nights, balloon dinners, and a brand new Saturday night Firework Finale courtesy of Sunniva, Inc. The festival kicks-off on Friday morning for the “Hot Air Balloon Breakfast & Race” at Big League Dreams Sports Park (BLD), 33700 Date Palm Drive, where attendees can enjoy an American breakfast while watching the balloons inflate on three ball fields at 6 a.m. and then launch and race across the Valley for prizes shortly after 7 a.m. Tethered balloon rides will also be available. Tickets for the breakfast and balloon race are $10 plus processing and are available at www.HotAirBalloonFest.com or at the door. On Friday evening from 6 pm to 8 pm, attendees can enjoy a Pinzimini Balloon Glow Dinner at the Westin Mission Hills Golf Resort & Spa featuring the delectable Tuscan-inspired flavors of Pinzimini Restaurant. Ticketed guests will dine at Master’s Plaza in the glow of a dozen seven-story high hot air balloons set on the 18th fairway of the Pete Dye resort course. An included glass of sparkling wine, musical entertainment and dancing will make it an evening to remember! The hot air balloon activities begin at 6 am with the inflation of 30 hot air balloons at Westin Mission Hills Golf Resort and Spa in Rancho Mirage. Around 7 am, the balloons will mass ascend into the sky one by one and float across the Coachella Valley. Free admission. Attendees can also purchase balloon ride tickets and fulfill their bucket list of flying in a hot air balloon across the Valley. Tickets available at www.HotAirBalloonFest.com. In addition, the festival offers tethered hot air balloon rides in Downtown Cathedral City, 68510 East Palm Canyon Drive beginning at 7:00 am until 11:00 a.m. Attendees may purchase the tethered rides onsite for $25 for adults, $20 for kids ages 5 -12 years, and free for children aged 5 years and under with an adult ticket purchase. At 11:00 a.m. in Downtown Cathedral City, be sure to bring the kids to the Festival Lawn for a brand new activity called the “Banana Balloon Candy Drop” where a giant banana balloon will lower to the ground, and once landed, kids can rush inside the festival lawn to grab up to 10,000 pieces of candy thanks to La Michoacana Dulceria / Candy Shop for free. Other afternoon activities include a professional kite show, Kid Zone, LIVE music, restaurant row featuring a great selection of local cuisine, beer and wine garden, and classic car club displays. At 4:30 p.m. families, couples or groups of friends wanting to share a wonderful dining experience should get reservations for the outdoor Sunset Balloon Glow Dinner in front of City Hall. Guests will enjoy a beautiful, outdoor 3-course dinner while listening to jazz favorites of multi-awarding winning jazz singer Yve Evans. Following the dinner, attendees will have passes to the VIP Viewing Lounge for the Saturday Night Balloon Glow to Music that begins at 6 p.m. Tickets are available at www.HotAirBalloonFest.com. 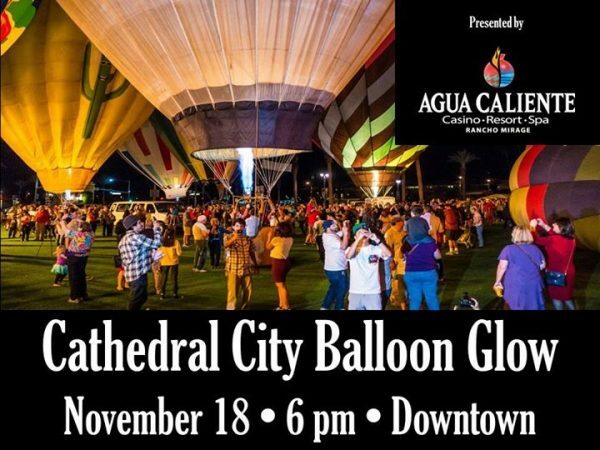 At 5:00 p.m. families should gather downtown to watch the inflation of up to 35 hot air balloons for the Cathedral City Balloon Glow to Music sponsored by Agua Caliente Casino Resort & Spa. This 45-minute balloon glow to music begins at 6:00 p.m. and will light up the night sky with a kaleidoscope of color, sound, and enjoyment. A VIP Viewing Section is also available for the Balloon Glow for $10 and includes a complimentary beverage. Tickets are available online at www.HotAirBalloonFest.com. Agua Caliente Paradise Rewards Members can pick-up a free pass to the VIP Viewing Section by going to the Players Club window at either casino locations in Palm Springs or Rancho Mirage. Following the balloon glow, enjoy LIVE local bands on the Main Stage while enjoying local cuisine and those 21 years and older may enjoy a beer and wine garden until 9:00 p.m.
At 9:00 p.m., festival goers will be treated to an amazing firework show in Downtown Cathedral City sponsored by Sunniva, Inc. The show will light up the night sky to music to cap-off the spectacular day of events. The balloon festival rises early on Sunday morning at 6:00 a.m. at Agua Caliente Casino Resort & Spa, 32-250 Bob Hope Drive in Rancho Mirage with the inflation of balloons. At 7 a.m., a mass balloon ascension will happen as 35 balloons fly over the Coachella Valley. Guests can also enjoy breakfast at the Waters Café inside the casino or take a tethered hot air balloon ride nearby. The festival offers free admission and free general parking. All balloon activities are weather and F.A.A. permitting. For all balloon festival information, go to www.HotAirBalloonFest.com or www.DiscoverCathedralCity.com. On Saturday, November 25th, gather the family, blankets and/or chairs for “Movies in the Park” located this season at the Downtown Festival Lawn, 68600 East Palm Canyon Drive (HWY 111) in Cathedral City. The free event, hosted by the Cathedral City Evening Rotary and sponsored by the City of Cathedral City, happens once a month on a Saturday evening between November and May, at 7:00 pm, except for the month of May, which begins at 8:30 pm due to daylight savings time. 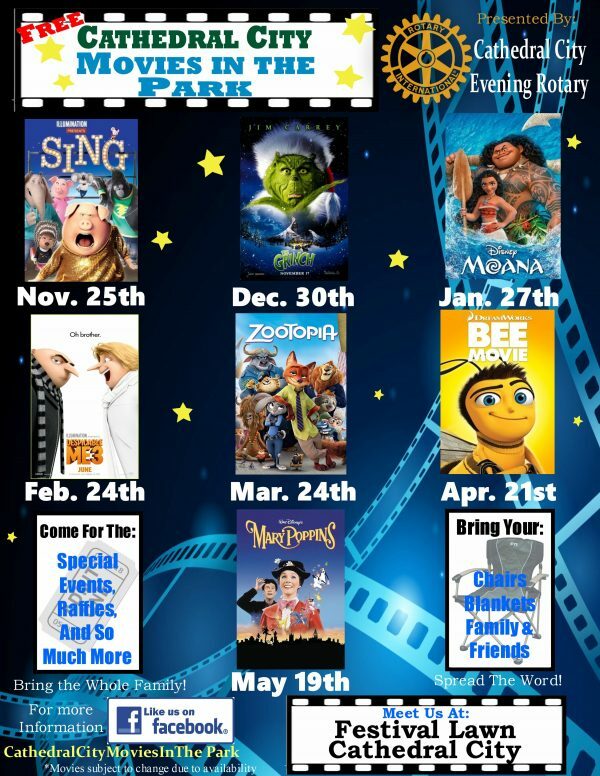 The November movie is “Sing.” You are welcome to bring snacks or non-alcoholic drinks, but you can also purchase them from the movie organizers at the concession stand. 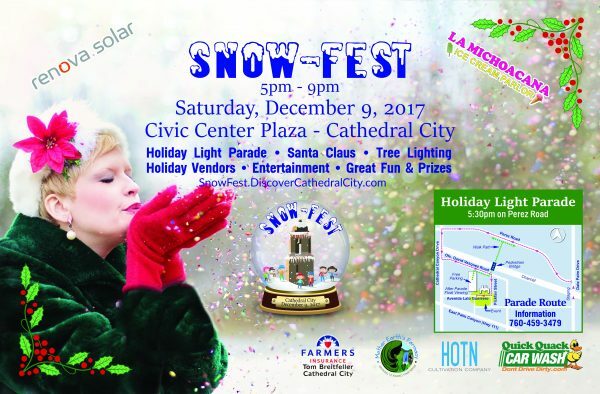 Finally, on Saturday, December 9th from 5 pm to 9 pm, bring the entire family for this brand new event that shall become a tradition for Cathedral City, called Snow Fest! It captures all the holiday spirit and places it at one event. You will enjoy an outdoor market featuring holiday arts & crafts, food, treats, and beverages including hot chocolate. At 5:30 pm, the night-time holiday lights parade with more than 40 contingents begins at the corner of Date Palm Drive and Perez Road and winds its way down Perez Road to Cathedral Canyon Drive and back to City Hall where the festival portion is held. At 6:30 pm, join the Mayor and Santa Claus for the annual lighting of the Cathedral City Holiday Tree in front of City Hall. Stay to listen local choirs sing, take a picture of Santa Claus with the kids, view and take selfies with the big holiday light floats, and wander through Town Square Park that will be transformed into a winter wonderland. Project Santa to the Rescue and McDonald’s will hold a silent raffle with fantastic prizes to raise funds for SafeHouse of the Desert, a non-profit organization that helps youth and teens in crisis. At 7:00 pm, take the family to the Mary Pickford Theatre for a free holiday movie. Or stay at the festival and pick up free passes to Desert Ice Castle (limited to 300 passes) for a free ice skating event on Tuesday, December 12, 2017. Free Admission. Free parking in the City’s Downtown Parking Garage. It’s most wonderful time of the year! 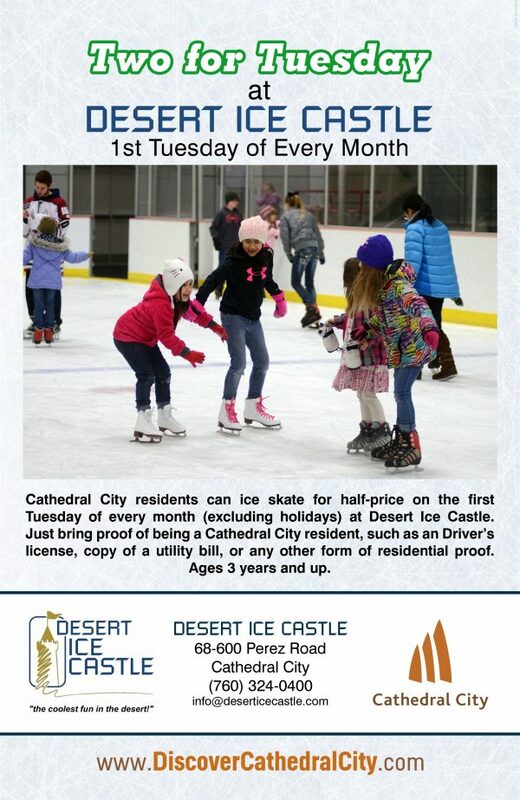 • Two for Tuesday at Desert Ice Castle where Cathedral City residents can ice skate from 7:30 pm to 9:00 pm for half price (proof of residency required). 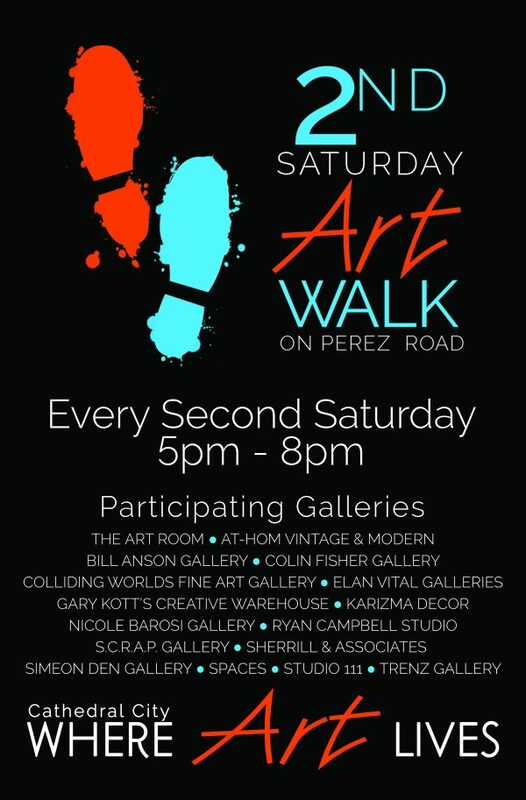 • 2nd Saturday Art Walk occurs on the second Saturday of each month at more than a dozen art and design décor galleries from 5 pm to 8 pm. 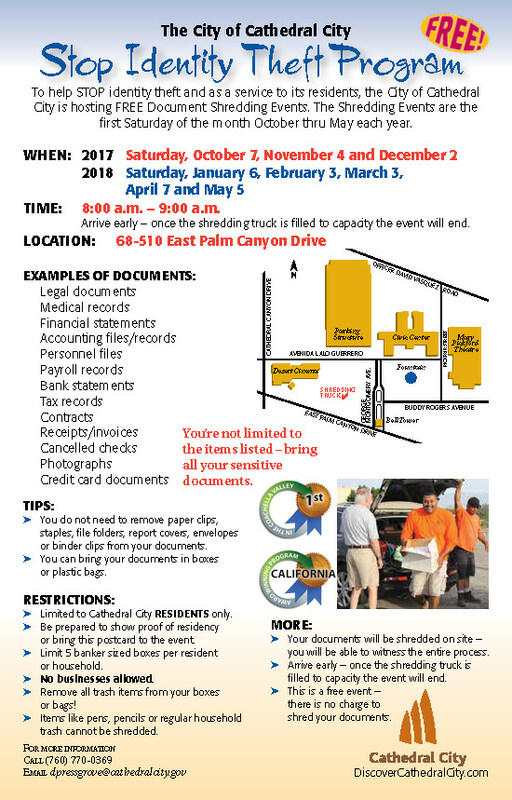 • Stop Identity Theft – Shred Event happens on the 1st Saturday of each month from 8 am to 9 am near the Festival Lawn in Downtown Cathedral City. Residents can bring a box of papers that they would like to shred and have destroyed. 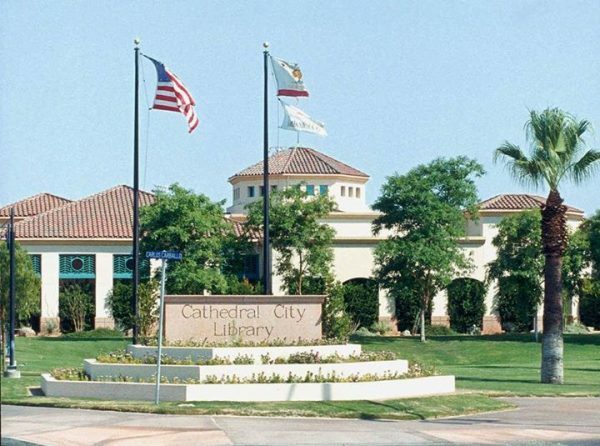 • City Hall at Your Corner happens once a month at various times and locations throughout Cathedral City where residents can talk to two councilmembers about anything important to them in a casual setting. Join the Fun as Cathedral City continues to provide great family entertainment for its residents and visitors alike by celebrating our diversity, bringing people together to build a community spirit, and showing the world that Cathedral City is a great place to live, work, dine, stay and play! Here's the inside scoop on the Hot Air Balloon Glow sponsored by Agua Caliente Casino Resort & Spa scheduled for Saturday, November 18, 2017 at 6 pm in Downtown Cathedral City. More information at www.HotAirBalloonFest.com... Read more. 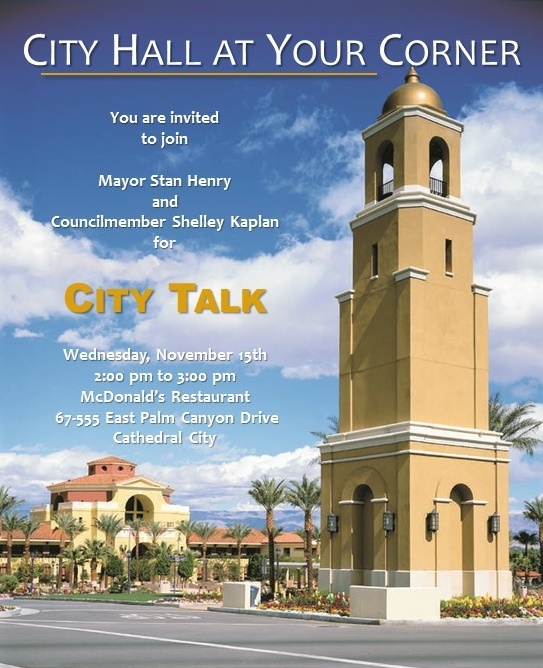 Have an issue you would like to speak to your city councilmembers about or learn what is happening in Cathedral City? Then join us for “City Hall at Your Corner” hosted by two members of the City Council, Mayor Stan Henry and Councilmember Shelley Kaplan.